The vocalist and guitarist Stian Krogh has shirked off his last band THE CARBURATORS. His latest band PAIN CITY brings a fresh perspective and more freedom for Krogh to experiment and evolve creatively. This release does show, thankfully, how PAIN CITY have hit the ground running with a very solid and well honed collection of songs. The first thing that hits you is how “When Life Gets You” is so vast, in fact a fifteen-track monster, loaded with high-density riffs and intense decibel delights which begin beautifully with “How can it be bad”. This track is laced with the raw-cutthroat noise as punk collides with sleaze metal. There is a an almost eighties-vibe to the production, though a more stripped back approach works well for PAIN CITY. “Somebody To Fight” displays that very minimalist metal sound, Krogh’s vocals are somewhere between Lemmy and Gene Simmons, interesting and accessible without the pop-sellout commercialization. As “Someone” and “Ride On Fly High” continue the dramatic explosive theme nicely, whereas “Dance with you” has a synth-sunken into the mix, not too give it a softer feel but more similarly used on early releases by THE WHO, instead of being the focal point of the track it instead seems to give the song more depth. This is the experimenting which, although little nuances, they do bring that extra dimension throughout. “I Want It All” kicks back in with more dramatic chunky guitar and skillfully played grime metal, MOTLEY CRUE without the cliches. A highlight sticks out in the hell-for-leather “Forced To Rise”, the tracks don’t really slow down only slow slightly in tempo. PAIN CITY have banished romantic moments from this offering. Some tracks here gel together nicely, “Take Me Home” and “Time To Be Brave” are steadfast examples of that. Steady rockers which almost feel like one solid track twisting and turning. The approach taken to “When Life Gets You” is not too far off a concept-album, the theme which fires through the song cycle, merging them together effortlessly. That is one of the more admirable points you get from playback. Although lengthy with a fifteen-track conception, none of the tracks are over the five-minute mark, instead “When Life Gets You” runs at a blazing pace, not wholly original but in the same vein it is totally refreshing. The simplest construction at times is the best. 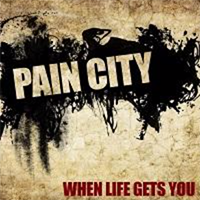 There are already rumors circulating of a second album due in the early months of this year, PAIN CITY are really the workaholic metal heads the genre needs.